There isn’t much info around on the .63 caliber Macho Fire paintgun that shot football shaped paintballs from a magazine, but rumors point to Steven Buzick, from Confederate Arm Supply, Rebline and the Southern California field, Southern Comfort as the man behind the business. 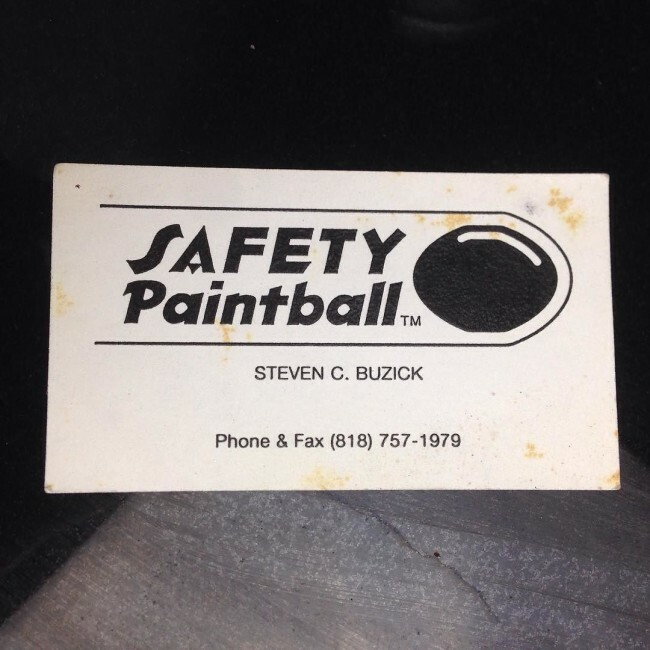 Steven Buzick’s Safety Paintball Business Card. I hadn’t come across any proof of this until I received this business card in the mail today, in a vintage paintball business card lot from Glenn Pensinger, at Hole in the Wall Paintball. This card clearly solidifies that connection with Buzick’s name printed on it. I’m still curious about the link between USI’s eliminator and Jim Masse possibly producing the parts. Safety Paintball created a .63 caliber paintball was shaped like a football and launched out of a paintgun nearly identical to the USI Eliminator. The only difference between the Macho Fire and the Eliminator was that the Macho Fire used magazines and came with a spiral rifled barrel. This Macho Fire was prototyped in the early 1990s and very few exist. A look at a Bore Drop Team AGS pump paintgun I found last year. The included Hypertech internals along with other high end parts made a competitive package. This video quickly shows how the VerbeekOlater pump breaks down for cleaning. This design is very similar to the later Rebline pumps. A look at the internals out of the VerbeekOlater pump. The bolt in this set of internals is longer than a standard bore drop bolt but would fit a Rebline. I've had a hard time tracking down information on either Steve "The Colonel" Buzick or his field, Southern Comfort until I found clues in old magazines.